I love shrimp cocktail ….. so why not make it at home instead of buying that frozen ring with the canned cocktail sauce?? I get it, when you are in a hurry, or just need to pick something up – those work. If you have a few minutes though, and really only a few moments, make your own at home, infusing the shrimp with flavour along the way …. Pour all ingredients except shrimp into a medium saucepan, and heat to boiling. Turn down the heat and allow flavours to simmer and blend for about 5 minutes. Add the shrimp, stir, and cover with a lid. Remove from heat and allow shrimp to poach for 10 minutes. Keep an eye on them, you don’t want them to do any more than turn pink. Strain the shrimp out and put in fridge to completely cool. 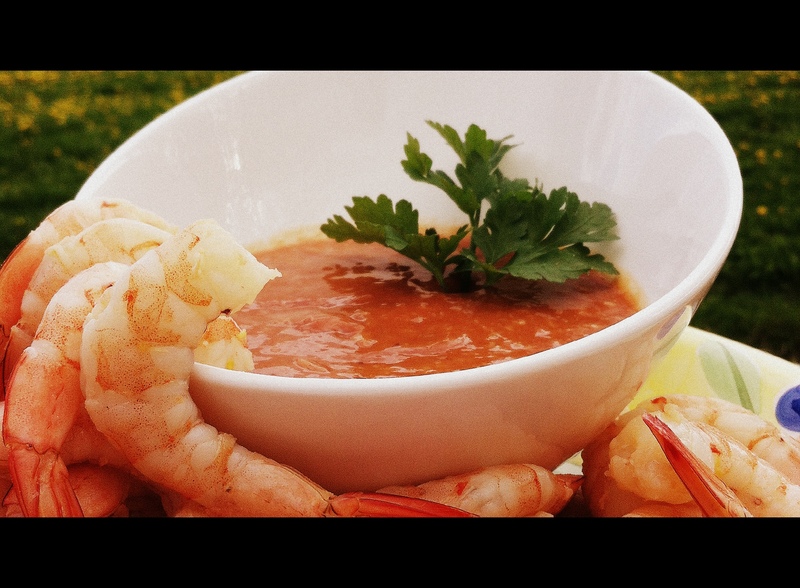 This entry was posted in Appetizers, Recipes and tagged appetizer, cocktail, cocktail sauce, prawns, seafood, shrimp, shrimp cocktail by Chatty Kathy. Bookmark the permalink.